April | 2015 | What Next? I’ve Got My Camera Back! I’ve got my camera back! 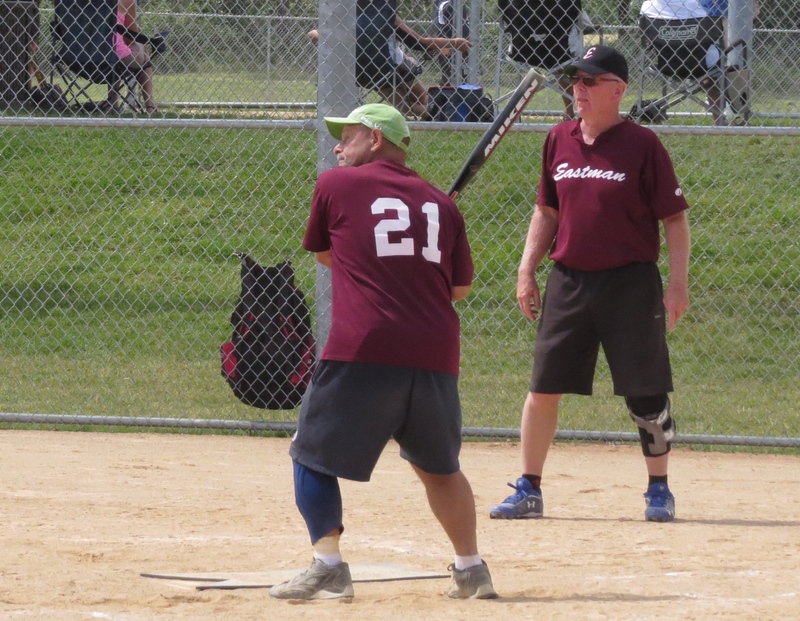 Last July I went to Bemidji, Minnesota because my husband Dave’s baseball team was playing in a tournament there. I took along my small Canon camera and used it throughout the weekend. When we arrived back in Winnipeg I looked in the backpack where I thought I’d put the camera but it wasn’t there. I searched through all our bags and our car. No camera! I phoned our Bemidji hotel, restaurants where we’d had meals, even the recreation complex where the baseball tournament was held. No one had seen my camera. I resigned myself to its loss. Then in February I got a mass e-mail from my friend Rebekah who lives in Minneapolis. We had gone to Minneapolis for Rebekah’s wedding several weeks before the ball tournament and I had used my Canon camera to take lots of photos at the wedding. 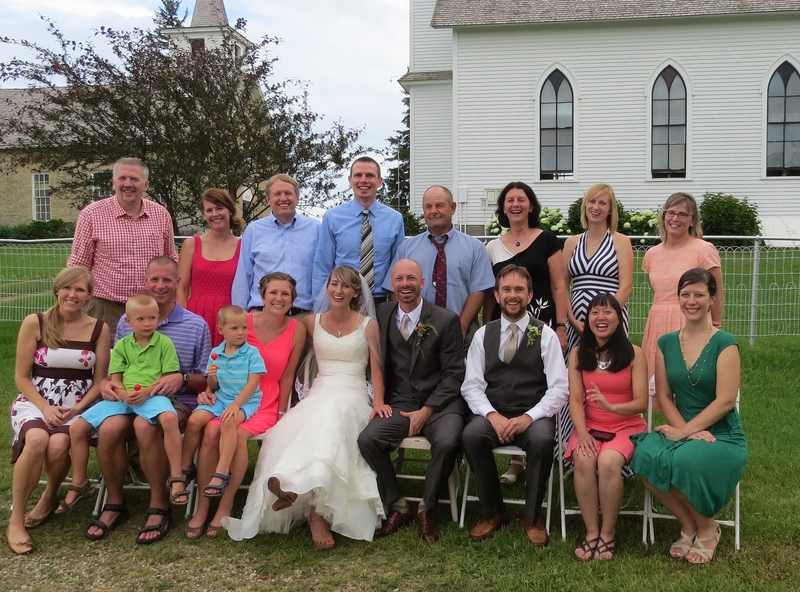 Rebekah said a man named Dan from Puposky, Minnesota had contacted her via Facebook and said he’d found a digital camera that had a photo on it’s memory card of a printed program from her wedding ceremony. 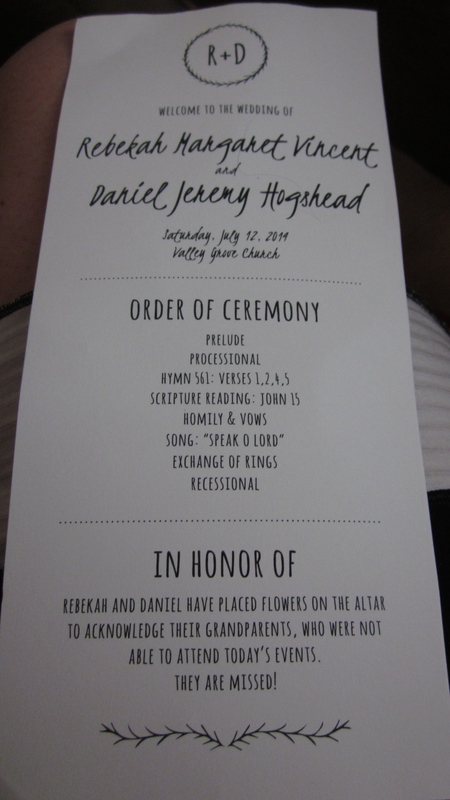 The program listed Rebekah’s first and last name and so he had found her on Facebook and sent her a message to find out if perhaps the camera belonged to her or one of her wedding guests. Rebekah promptly sent out a message to all the people who had been on her wedding guest list to see if the camera belonged to one of us. I e-mailed Rebekah and she gave me Dan’s contact information. I sent him a letter and he replied immediately attaching some photos he’d found on the camera’s memory card. There was no doubt they were mine. He told me his mother was a cleaning woman at the hotel where we’d stayed in Bemidji. She had found the camera and turned it in to the front desk. I’m not sure why the hotel said they hadn’t found my camera when I called them, but in January after it had been at the front desk for six months the hotel manager told Dan’s mother she could have the camera since she had found it. Dan’s Mom gave him the camera to use in February when he was leaving on a holiday and that’s when he discovered my photos. He decided the right thing to do would be to try and find the camera’s owner. 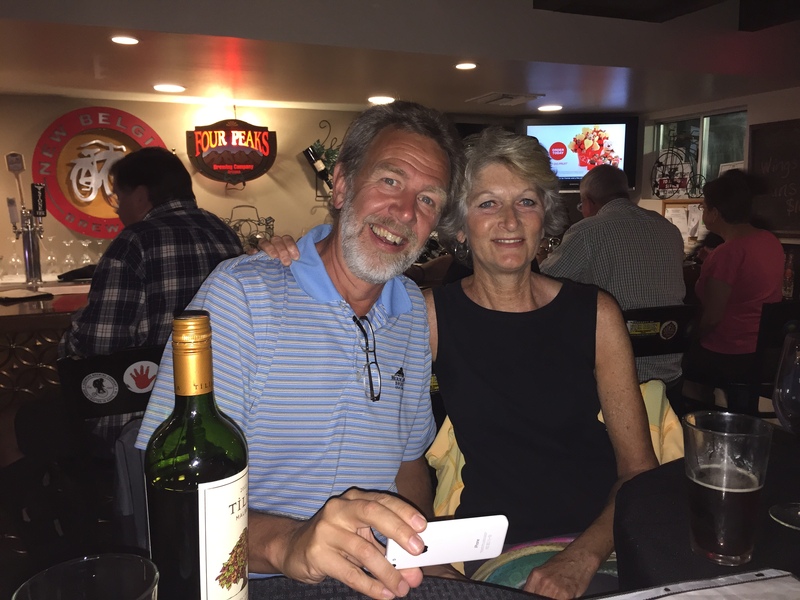 I was vacationing in Arizona in February when this all transpired and by the time Dan e-mailed and said he was going to send my camera back to me we were almost ready to leave for home. 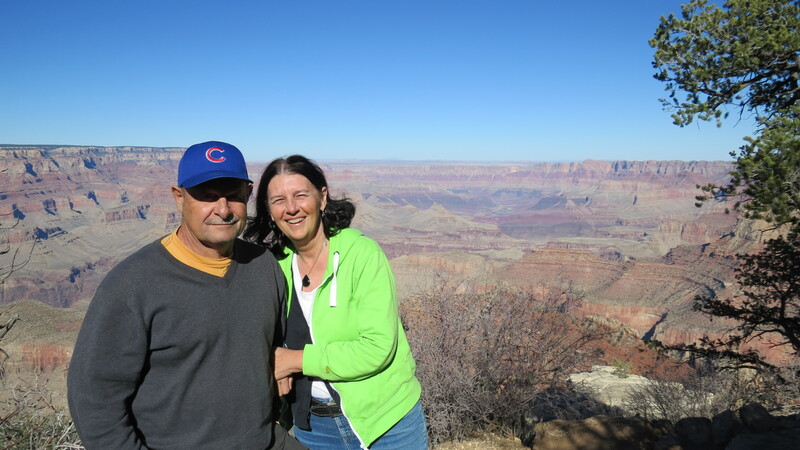 So I asked Dan to send the camera to the Arizona address of our good friends Rudy and Sue who were going to be in the United States till the end of March. Rudy and Sue returned to Manitoba at the beginning of April and a few weeks ago when my husband Dave was substitute teaching in Steinbach he picked up my camera at their house. That camera had been on quite a journey! I e-mailed Dan to let him know I had my camera. I asked how much postage he’d paid to mail the camera and told him I’d be happy to reimburse him. He said he didn’t want any payment. I should just pass his good deed forward. I assured him I would. I told Dan I tried to live my life in the belief that most people in this world are kind and good and he certainly was proof of that. Thanks to his honesty and perseverance I have my camera back! I’ve learned to play three new games. 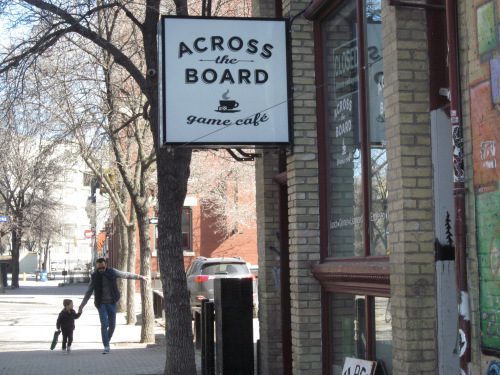 Our son and his wife had given us a gift certificate at Christmas for an evening at Across the Board a new games cafe here in Winnipeg, so plans were made to ‘cash in’ our certificate last Friday. 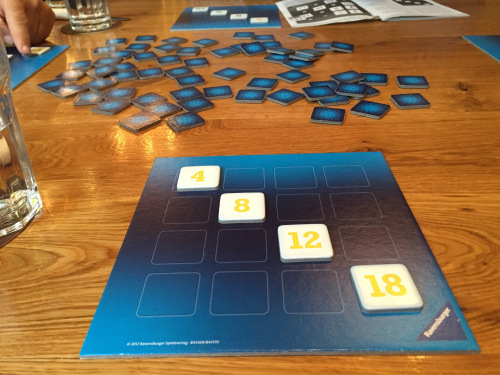 After a delicious supper we tried our hand at three games I’d never played before. They have over 700 games filling the shelves along the wall at Across the Board and if you pay $5.00 you can play all evening. 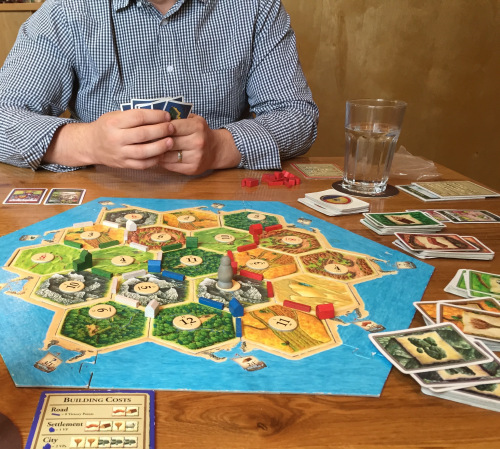 The first game we played was Settlers of Catan. It was interesting but there is lots of stuff to remember and it involves a fair bit of strategy and planning ahead. After playing it just once I learned many things I’d do differently if I played it a second time. 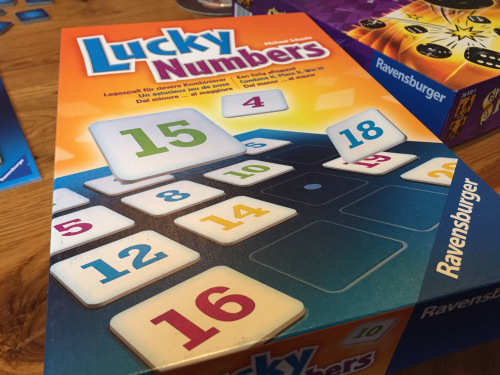 Another game we tried was Lucky Numbers. It wasn’t hard but fun and would make a great family game for people with elementary school aged children. 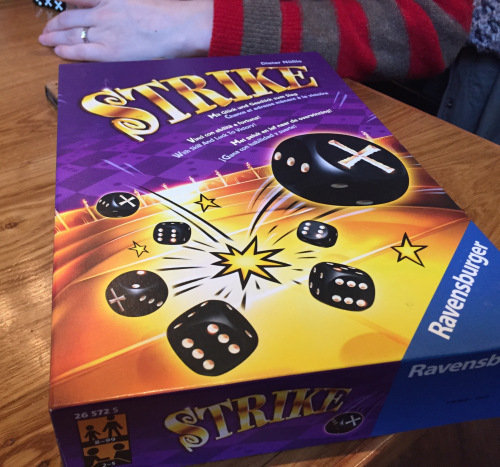 The third game Strike was my favorite. I’ll admit that could be because I won three of the four matches. 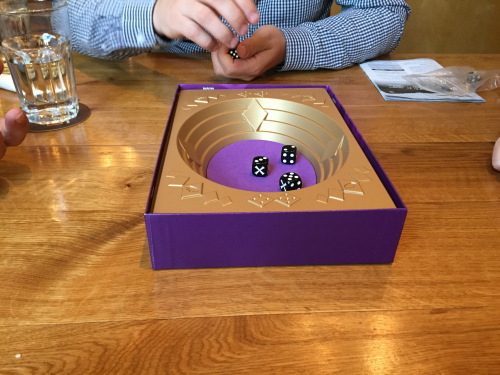 Each player has seven dice which are thrown into a pit. You can choose how many dice to roll at time. There is strategy, skill and luck involved. I will definitely buy Strike for us to play at home. We had a good time at Across the Board. The place was full and busy on Friday night. I’m sure we will be going back again. Athena is a leadership group for Manitoba women based in Winnipeg. Through mentorship, networking and philanthropy they provide women with personal and professional development and an opportunity to network, share expertise and enhance leadership skills. A look at their website reveals a long list of influential Manitoba leaders who have acted as mentors for the group. One of the group’s projects is Dress for Success an annual drive to collect gently used women’s professional clothing for women re-entering the work force who may not be able to afford the proper business attire for job training and interviews. They give an annual leadership scholarship to a deserving young Manitoba woman. This year’s winner was Acqueline Masvikeni a science student at the University of Manitoba who wants to become a doctor and has volunteered for many humanitarian organizations. Athena also sponsors an annual group build for Habitat for Humanity. Although there is no information on the Athena website as to why the group chose to share a name with the Greek god Athena I’m guessing it could be because Athena was known as a wise, strong and courageous woman, the inventor of nearly every kind of work in which women are employed, and a defender of law and justice. This post is the second in a series inspired by the current Olympus exhibit at the Winnipeg Art Gallery in which I look for cultural connections to Greek and Roman gods in Winnipeg. In honor of the new Olympus exhibit at the Winnipeg Art Gallery I’m going to look for references to Greek and Roman gods right here in the city where I live. The Golden Boy atop the Manitoba Legislature Building was created in France by sculptor Georges Gardet and modeled after a 16th-century sculpture of the Roman god Mercury. Mercury’s Greek counterpart is Hermes. On Wednesday I had the privilege of getting a sneak preview of the upcoming Olympus exhibit at the Winnipeg Art Gallery with Dr. Andreas Scholl the Director of the Collection of Classical Antiquities, National Museums in Berlin. I learned so much! Here are ten intriguing facts he shared with us that I know the kids I take on tours are going to find fascinating. 1. A trained Greek sculptor would have spent a whole year creating a life-size statue of a god. 2. Although most ancient Greek and Roman statues we see on display are white actually in their original state they were colorfully painted by trained artists. Most of this paint has weathered off but you can still see traces of color on some of the statues. 3. Greek vases had many uses. Some were given as presents. They were used for practical things in households like holding oil and wine, carrying water or storing perfume. Vases were also put in graves to equip the dead for their life in the underworld. The reason we have so many vases from ancient Greece is because thousands were preserved in tombs. 4. Vases and sculptures were repaired and we can see these repair jobs on some of the pieces in the exhibition. Statues were repaired with tree resin and vases with bronze clamps. 5. 14,000 people would attend Greek theatre performances and the actors had to speak in a way that would allow everyone to hear them. Wearing masks with exaggerated expressions made the actors’ emotions visible to audience members sitting further from the stage. 6. Victors at the Olympics were given amphora vases filled with olive oil. Olive oil was very expensive. These trophies have been found all over the Mediterranean area because Olympic competitors came from places throughout the empire. Some of these trophy vases have the name of the athlete on them as well as the year in which they competed. 7. After World War II Russia confiscated many German artworks. These treasures were shipped to Russia on open train cars. Some have been returned to Germany. You can see a red number on the back of certain pieces in the current exhibit at the Winnipeg Art Gallery. These numbers were inked in by the Russians to identify the objects. 8. Ship wrecks have been found in the Mediterranean filled with thousands of Greek sculptures that were on their way to Naples where rich Romans were ready to buy them. 9. Some sculptures have plow marks on them because they were found in farmers’ fields where they had been buried for centuries. 10. Greek vases when they are empty are actually quite light. Dr. Scholl spent nearly two hours with us and I learned lots of history as well as many interesting facts about the artwork that is part of the Olympus exhibit. I’ve bought the collection catalogue now and I am learning more as I prepare to give my first tours of Olympus next week. 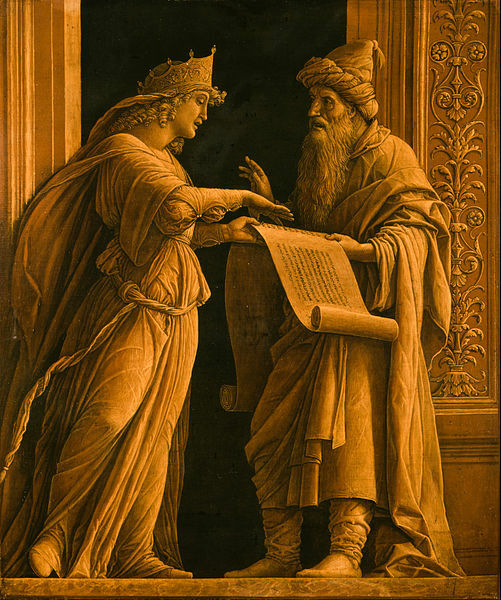 Huldah was a teacher, a prophetess, a caregiver for a king and descendant of the great Israelite leader Joshua. I knew very little about Huldah still I started working on a religious education curriculum lesson about Josiah. Josiah whose story is found in 2 Kings 22 became king when he was only eight. According to Midrash sources he was cared for in his childhood by Huldah and her husband Shallum who was the keeper of the king’s wardrobe. Josiah’s father and grandfather had been corrupt and evil but under the tutelage of Huldah and Shallum, Josiah grew to be a man of integrity who wanted the children of Israel to follow God’s way. Huldah had a religious school in Jerusalem. She was a scholar whom Israelites came to consult. In 2 Kings 22 King Josiah consults his friend Huldah when an ancient copy of God’s laws are found during a temple cleanup. 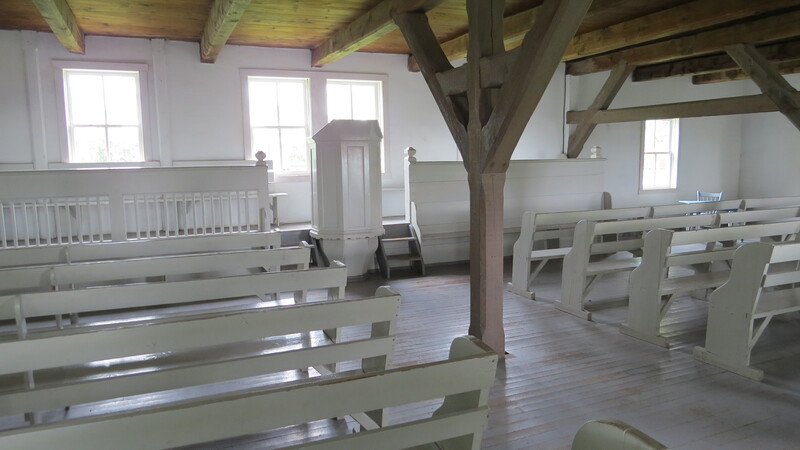 Josiah realizes his people have not been obedient to God and asks Huldah what he should to. The two southern gates of the temple in Jerusalem were named after Huldah because they led to the building where she held her school. The gates are still called Huldah’s Gates today. In my curriculum I created a Facebook page for Huldah listing all her pertinent information and creating posts from people asking Huldah for advice. I invited children to write a Facebook post of their own consulting Huldah about something important to them about which they might need advice. The male prophets tend to be front in centre in most of the Bible and I want young people, especially young women, to know that there were female prophets as well who played a key role in the history of Israel.